KOCH, Edward Irving, a Representative from New York; born in the Bronx, N.Y., December 12, 1924; studied at City College of New York; LL.B., New York University Law School, 1948; combat infantryman with rank of sergeant, 1943-1946; admitted to the bar in 1949 and commenced practice in New York City; elected Democratic district leader of Greenwich Village, 1963-1965; delegate to State convention, 1964; elected to New York City Council, 1966; elected as a Democrat-Liberal to the Ninety-first and to the four succeeding Congresses and served from January 3, 1969, until his resignation December 31, 1977, to become mayor of New York City for the term commencing January 1, 1978; reelected mayor in 1981 and 1985; died on February 1, 2013, in New York City, N.Y.
Papers: 1969-1977, 157 cubic feet. Collection is congressional papers and correspondence, including legislative, subject, and case work files; materials relating to New York City, campaigns, committee work, and the 1974 Judiciary Committee impeachment inquiry; press releases; invitations; appointment books; and photographs. Unprocessed. Papers: 2 letters (February 21 and March 24, 1969) in the Howard J. Samuels papers. Letters are political correspondence. Finding aid in repository. Papers: In the papers of Francis T.P. Plimpton, 1901-1985, 31.5 linear feet (ca. 24,000 items in 75 boxes). Correspondents include Edward Koch. Papers: In the records of the National Association of Commissions for Women, 1975-1982, 1.25 linear feet and 8 cassette tapes. 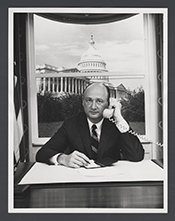 Collection includes tape of 1980 annual conference, including speech by mayor Edward Koch. Papers: In the correspondence and subject files of the New York State Committee on Sentencing Guidelines, 1983-1986, 6 cubic feet. Collection includes legal papers and other materials concerning a legal suit by Mayor Edward Koch and the city of New York against the committee. Papers: In the professional papers of Robert Charles Weinberg, 1912-1974, 1928-1973, 964 cubic feet. Correspondents include Edward Koch. Browne, Arthur, Dan Collins and Michael Goodwin. I, Koch: A Decidely Unauthorized Biography of the Mayor of New York City, Edward I. Koch. New York: Dodd Mead, 1985. Goodwin, Michael, ed. New York Comes Back: The Mayoralty of Ed Koch. New York: PowerHouse Books, 2005. Koch, Edward I. Politics. New York: Simon and Shuster, 1985. ___. Ed Koch on Everything: Movies, Politics, Personalities, Food, and Other Stuff. Secaucus, N. J.: Carol Publishing Group, 1994. ___. Giuliani: Nasty Man. New York: Barricade Books, 2007. ___. The Koch Papers: My Fight Against Anti-Semitism. Compiled by Rafael Medoff. New York: Palgrave MacMillan, 2008. Koch, Edward I., with Christy Heady. Buzz: How to Create It and Win With It. New York: AMACOM, 2007. Koch, Edward I., and Daniel Paisner. Citizen Koch: An Autobiography. New York: St. Martin's Press, 1992. ___. I'm Not Done Yet: Keeping At It, Remaining Relevant, And Having The Time Of My Life. New York: William Morrow, 2000. Koch, Edward I., with Herbert Resnicow. Murder at City Hall. New York: Kensington Books, 1995. Koch, Edward I., and John Joseph O'Connor. His Eminence and Hizzoner: A Candid Exchange/John Cardinal O'Connor and Edward I. Koch. New York: Morrow, 1989. Koch, Edward I., with Leland T. Jones. All the Best: Letters From A Feisty Mayor. New York: Simon and Schuster, 1990. Koch, Edward I., with Pat Koch Thaler. Eddie: Harold's Little Brother. New York: G. P. Putnam's Sons, 2004. ___. Eddie's Little Sister Makes A Splash. New York: Putnam, 2007. Koch, Edward I., and Wendy Corsi Staub. Murder on Broadway. Kensington Books, 1996. ___. Murder on 34th Street. New York: Kensington Books, 1997. ___. The Senator Must Die. New York: Kensington Books, 1998. Koch, Edward I., with William Rauch. Mayor. New York: Simon and Shuster, 1984. Mollenkopf, John H. A Phoenix In The Ashes: The Rise and Fall of The Koch Coalition in New York City Politics. Princeton, N. J.: Princeton University Press, 1994. Newfield, Jack, and Wayne Barrett. City For Sale: Ed Koch and The Betrayal of New York. New York: Harper and Row, 1988. Ralph Nader Congress Project. Citizens Look at Congress: Edward I. Koch, Democratic Representative from New York. Washington, D. C.: Grossman Publishers, 1972. Shestack, Mel, and Sayre Ross, eds. How'm I Doing? : The Wit and Wisdom of Ed Koch. Forward by Clive Barnes. New York: Lion Books, 1981. Strouse, Charles. Mayor: The Musical. New York: N.p., 1987.